The Martello tower stands on the site of a former motte castle of the St. Lawrence Estate. It is also said to have been the site of the original Howth Castle. The museum gets its name from a comment made by the late Seán Lemass (former Taoiseach) while visiting the radio studios of Radio Éireann in Dublin. He referred to the radio service as “the old hurdy-gurdy” as whilst on his visit to the studios the RTÉ Concert Orchestra (then known as the Radio Éireann Light Orchestra) was tuning up… and the sound was reminiscent of a ‘hurdy-gurdy’. The museum first opened in 2003, Pat Herbert, the curator, had been looking for a suitable premises to display his vast collection of radios, gramophones and other radio-related paraphernalia. 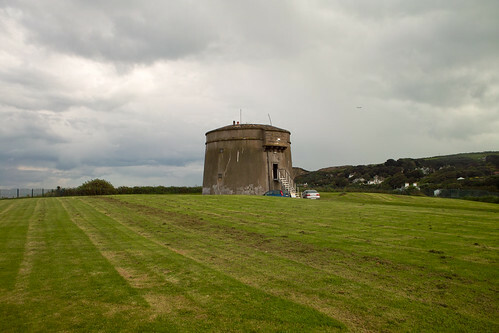 Fingal County Council offered the recently refurbished Martello Tower to Pat for use as a museum. Pat maintains the museum as a labour of love. It is not run as a commercial enterprise. He enthusiastically gives of his time voluntarily, purely for the pleasure and enjoyment he derives from it. He is joined in his efforts by a team of volunteers, who all provide tours and introductions to the collection. The British built about fifty Martello towers around the Irish coastline, especially along the east coast, from Millmount (Drogheda), to Bray, around Dublin Bay but also around Cork Harbour on the south coast. On the east coast, concentrated mainly around Dublin Bay, twenty-six towers were in line of sight of each other, providing the ability to communicate with one another, or warn of any incoming attacks. Possibly the most famous is the Martello tower in Sandycove, near Dún Laoghaire, in which James Joyce lived for a few days. Joyce shared the tower with Oliver St. John Gogarty, then a medical student but later to become famous in Irish history as a surgeon, politician and writer. In Ulysses, the fictional character Stephen Dedalus lives in the tower with a medical student, Malachi "Buck" Mulligan, whom Joyce based on Gogarty. The James Joyce Tower, as the tower is now known, houses a museum dedicated to Joyce. A number of other Martello towers are extant nearby at Bullock Harbour, Dalkey Island, Williamstown, Seapoint and Sandymount and Martello towers feature in many literary works set in Dublin. During the 1980s, Bono owned the Martello tower in Bray, County Wicklow. Martello Tower South No.7, on Tara Hill, Killiney Bay, is unique, as is its location as an enfilading tower. The Tower is privately owned and has been fully restored, to include a proofed, working King George 3rd Blomefield 18-pounder cannon mounted on a traversing carriage on the crown of the Tower. There is a three-gun battery below the tower, with a glacis. There is also a coach house, artillery store, tool shed, and gunner's cottage, with resident gunner and gunpowder store. The battery, while restored, remains to be armed and the coach house and artillery store still require some restoration. On the north side of the city, one can find Martello towers in Balbriggan, Portmarnock, Howth, Sutton, Donabate, Malahide (Hicks tower) and Ireland's Eye. There were seven Martello towers in the vicinity of Cork Harbour of which five are extant. During the 19th century Fenian uprising, the famous Captain Mackey briefly captured and held the Monning Martello tower near Fota Island in Cork Harbour; this tower is believed to have been the only Martello tower ever captured, other than the original. The other Cork Harbour towers are at Ringaskiddy, Haulbowline Island (now part of the Irish Naval Service HQ) and at Belvelly and Rossleague on the Great Island (near Cobh). There are also Martello towers at Little Island and Rostellan, though these are no longer intact. The British built two Martello towers on the Hook Peninsula to protect the fort near Duncannon, Co. Wexford and the entrance to Waterford Harbour. There is a third tower on the headland at Baginbun Bay in Co. Wexford. One of the most interesting Martello towers is Meelick Martello Tower at Clonahenoge, County Offaly, guarding the Shannon river crossing to Meelick, County Galway. As this tower supports three guns (unlike the normal Martello tower which is circular on plan and carries only one gun), it is cam shaped on plan. Currently a rampant growth of ivy covers the tower. The tower at Seapoint, County Dublin, was formerly the headquarters of the Genealogical Society of Ireland (GSI). The GSI vacated the tower when it found that the atmosphere was not conducive to the preservation of records. The restored tower at Ilnacullin is a feature of an island garden in Glengarriff, County Cork. Several other towers are still extant, including one at Rathmullan in County Donegal and two in County Clare on the south coast of Galway Bay in the townlands of Finavarra and Aughinish.